The film was panned by most critics, scoring a 17 percent "Rotten" rating on Rotten Tomatoes. Its consensus states, "Neither funny nor suspenseful, this heist / teen flick also fails to explore its potentially socially relevant premise". Slant Magazine critic Keith Uhlich called it an "MTV film that extreme right-wing moralists can be proud of, as it posits a quintessentially American world of racial, intellectual, and sexual conformity." Many compared the film unfavorably with The Breakfast Club, and many even called it a rip-off. Entertainment Weekly wrote the film off as being "like The Breakfast Club recast as a video game for simpletons." Likewise, Roger Ebert awarded the film two stars out of four, calling the film "too palatable. It maintains a tone of light seriousness, and it depends on the caper for too much of its entertainment value." 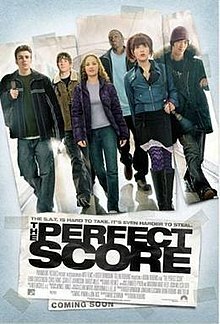 Ebert's review went on to point out that The Perfect Score was given a wide release, but that Better Luck Tomorrow, a teen drama film that received much more acclaim, was given a very limited release.